We were searching for a beach (guess why), and after following some winding narrows roads, we eventually came to a small overgrown path leading to the sea shore. Along the side of the path there was this sign. I'm not sure what it said, but it sure seemed important. This sign was much easier to understand and was much more entertaining. I forget when this was taken, but I found it amusing. Then Angie borrowed my camera and I ended up with lots of pictures like these. Phew! I got my camera back. There were some people parasailing over the cliffs at the beach near Odo Coast. There were also a few people wandering on the coral hunting for stuff. This person was holding a big net, so I assume they were catching stuff to eat, although I'm not certain. Many of the people at this ocean spot weren't very friendly so I didn't find out what they were looking for. I said my best "konichiwa" to every person as I walked past them, and not a single person returned the greeting or even looked my way. While there was a large parking area for the beach, there weren't any signs or anything pointing out this area and we just discovered it by accident, so maybe the local people were disappointed to see Americans on their secret beach. While walking on the rocky beach, there were these small critters running around all over the place. They moved quite fast and it was kind of creepy. 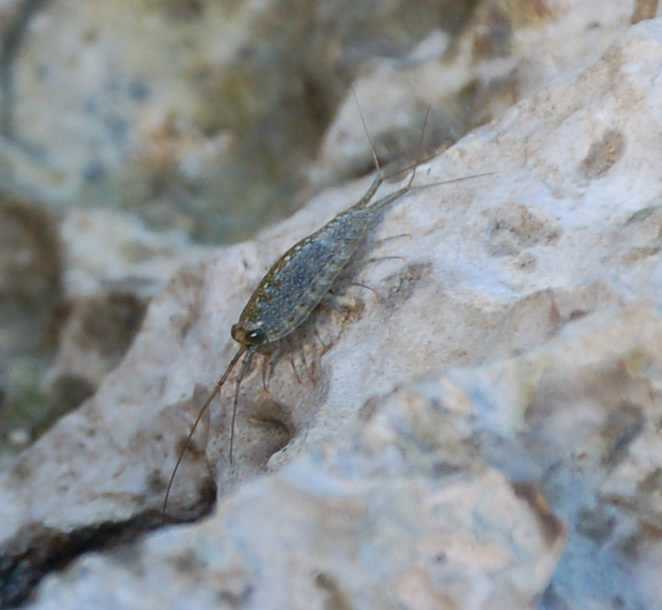 It was even creepier once I got a picture of one and saw what it looked like up close. Uh oh. Angie took the camera again.... Can you guess who isn't afraid of the sun? 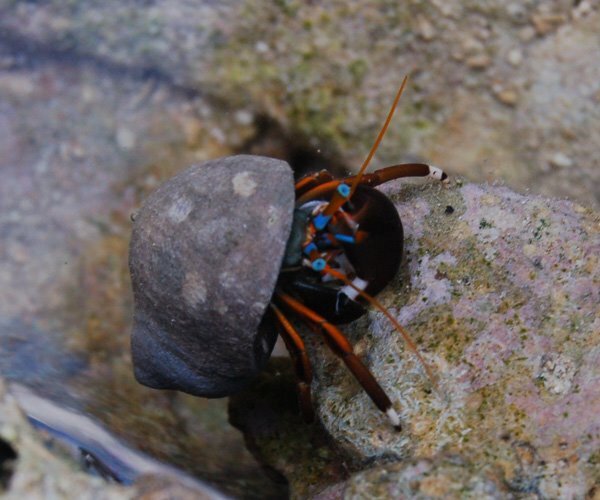 Angie took a really cool picture of a colorful hermit crab. I've never seen one with blue eyes before. At night we went to Kokusai Dori, a crazy street in Naha with all sorts of shops and stores. At night it's quite colorful with all the signs lit up. I had the best vegetable yakisoba at a little shop on the street. It only had two tables in it and some stools along the counter where the food was being cooked. I was surprised there was no one else in the place since the food was sooo "oishii" (delicious). It was so good we went back again on Friday night. I'm a day behind in my updates. Hopefully I'll get a chance to write some more later today about what we did yesterday (Friday). Be careful with your pronunciation of "oishii." In case Reeves hasn't already told you, I offer the following story: A semi-local English speaker told us how to say delicious, and since it was one of the few words that we knew, we said it after every meal to the waitress -- who inevitably gave us a weird look, then walked away. At some point, though, we found out that what we were actually saying was "oshii" -- "regrettable" -- and not "oishii." No wonder the waitresses were glaring daggers at us! Just wanted to let you know that I'm eating this stuff up Brian! Keep it coming. Hey Brian! It's Amanda (from Kodokai dojo), just thought I'd drop by to see how you guys are doing. Your sister gave me the address to your blog, and I'm really glad I checked it out. Your photos are absolutely amazing! It sounds like you're all having a wonderful trip - if you get this in time be sure to say hi to Aidan and Angie for me! These are some really cool photos!